Gauges: 12-16-24-32-42-53. These acoustic guitar strings feature a computer-controlled wrapping around a hex core. The popular alloy of phosphor bronze lends the depth needed to make a dreadnought guitar speak, while retaining the sparkle a fine instrument can produce. The Planet Waves Pro-Winder is a patented high-quality peg winder with a built-in string clipper. Ergonomically designed with hardened tool-steel wire cutters. 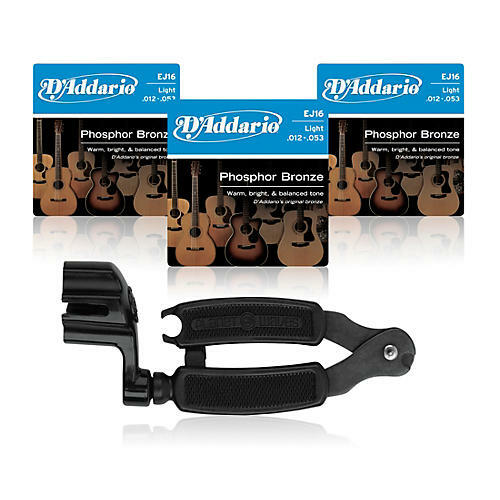 The Pro-Winder enables you to change strings with just a single tool. Easy and comfortable to use. Unconditionally guaranteed.